We've noticed something disturbing in Halloween costume décor. It's been an issue year after year. There are plenty of witches, skeletons, even aliens in people's houses during the season. We rarely, however, see the king of all villains represented. There is a dangerous lack of Darth Vader representation in seasonal décor. This year, you can start a trend, representing the Dark Lord of the Sith in your household. 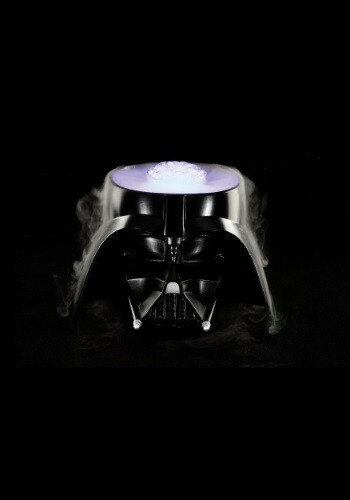 This Darth Vader mister with look awesome in a dim room. Just fill the bowl with plain tap water, plug it into an indoor outlet, and a strange misting effect will begin to take place. Transform your typical living room into something like Vader's meditation chamber. Whether you are hosting a Star Wars watching marathon or you're giving the Dark Lord his rightful place in your Halloween décor, this mister will be a unique centerpiece that's sure to start some conversations. Indeed, with this powerful light, you're friends might even refer to you as the dark master of the mister.